In 2009, I received an invitation by Monsignor Vincent Foy to attend the celebration of his 70th ordination anniversary as a priest. Little did I realize that, arriving at the church, I would have the privilege of serving at the altar with Archbishop Thomas Collins of Toronto. It was an encouragement for me to take part in honouring this tireless pro-life veteran. When Msgr. Foy wheeled his walker to the front of the altar to give a talk and was helped into a chair, I gazed at him with pride and joy, but also with a certain reverence. Our family had exchanged letters with Monsignor Foy over many years as we worked together to rebuild the Church of Christ as best we could, especially through the pro-life movement. Monsignor’s charity, generosity and encouragement meant a great deal to us. He would send something “for stamps” so that we could reach more people through the written word. Often he would send a little extra, since he knew of our work in the Canadian missions and that we depended on God’s providence for our needs. This wonderful man was like a father to us. 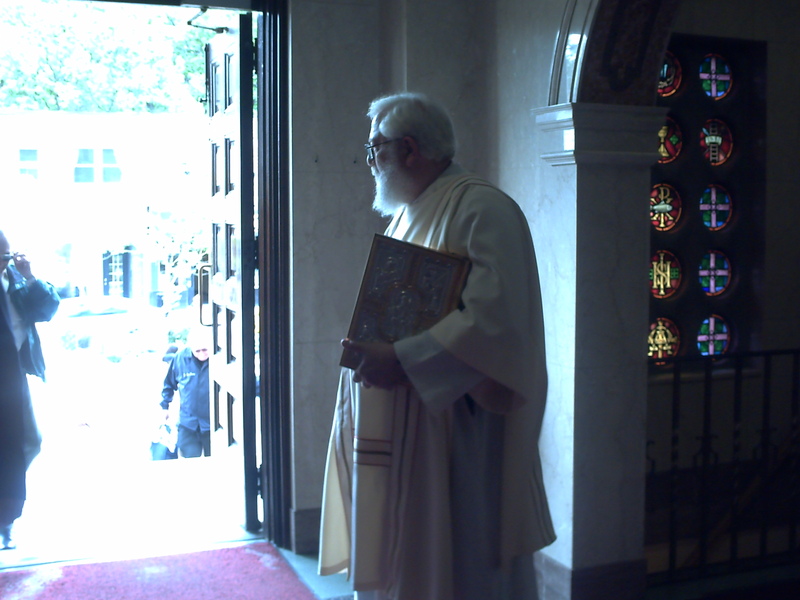 This wonderful priest was like a father to us. Our faith was strengthened by his example. Who was Monsignor Foy? I often picture Monsignor, as a fierce pro-life warrior, sword in hand and shield held high, walking ahead of me “fighting the good fight of the faith and crossing swords with anyone, just anyone, who would dare attack the Church founded by our Lord, Jesus Christ Himself.” Monsignor was a truly Catholic man who loved the church, his priesthood, the Eucharist, Our Lady and all the saints. His fidelity to Christ and his patience were key to his whole ministry. He was in “for the long haul.” To him life was not a game. It was actually saving souls and babies in the womb and enabling them to lead a good life and go to Heaven. It was as simple as that. God also blessed him with a sense of humour and a happy smile. At times he would even entertain others with his magic tricks. Though in relatively good health, he patiently endured certain ailments as well as the aches and pains of a long, long old age. Amazingly, he became one of the world longest serving priests, passing from the world’s stage at the age of 101.5 years! By God’s permission this tireless Christian witness lived up to his name, Foy which in old French means faith. This humble and simple priest was also a canon lawyer and a theologian. His perspicacity enabled him to be one of the greatest pro-life warriors Canada has ever known. He was well aware of how silly errors in doctrine, proposed by dishonest, glory-seeking and rogue theologians, could cause serious division and hurt the Church he so loved. Monsignor’s sharp intellect and balanced approach, as well as his loyalty to the teaching authority of the Church, enabled him to quickly find false teachings. Like a Jeremiah or an Athanasius, he bravely and persistently exposed the doctrinal errors despite, at times, near overwhelming opposition. However, his deep devotion to Our Lady sweetened his disposition toward his fellow men. The rosary was one of his greatest weapons. I will simply conclude by saying, if I were asked to give a fitting tribute to this good and humble priest, I would say that Monsignor Vincent Foy should be seriously considered by the Church as a candidate for sainthood. Behold the man who stood with Christ on the world’s stage. Let his legacy never be forgotten. To Monsignor Foy we pray. Remember us in your prayer, dear friend. Till we meet again. Adieu!